Blue Hawaiian is an easy going, productive, cerebral kind of high. A very sweet and earthy taste. I enjoyed it thoroughly and always love the great service I get from Kamelia. I love this store! They have a great selection of products to choose from. The staff is friendly and knowledgeable. The blueberry cheesecake mto had great flavor and was smooth smoking. Love it, one of best clubs in the Area..
First time ever to a dispensary. The bud tender explained all our dumb questions and they had some great flower product. Favorite. Hardly ever drive to Hood River for weed anymore. Good selection, layout that ACTUALLY MAKES SENSE, nice price range that doesn't sacrifice quality plus a really good deal now and then. The best concentrate I've had in OR no exaggeration. Now that I'm typing this reviewing I'm even more stoked it's so awesome to have a place like this in the dalles of all places. That review means alot to us. We appreciate the time you took to write this review and thank you so much for giving us a shot! See you soon. Super friendly,professional and quick! 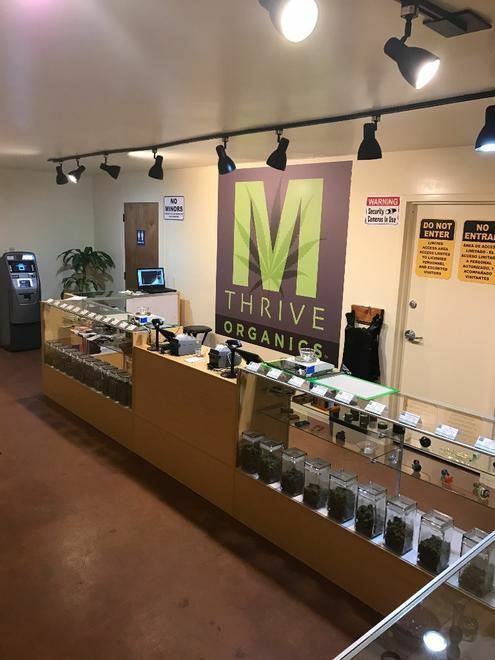 As a local I never go anywhere else since I found M Thrive. Thanks for stopping and giving a review....much appreciated, we try and do our best to help out. Make sure and check out our two newest strains from our friends at Frontier Farms Fire OG Kush 26.50% THC and Blue Dream 25.9% THC and with a little luck we will have SNO tomorrow afternoon 26.5% THC. Friendly and helpful service and I was in and out in a couple minutes. Excited about the new products they said were arriving tomorrow especially the chocolate edibles and my favorite the dab syringes.